Gallia Academy junior Hunter Copley (44) delivers a pitch during the Blue Angels’ 2-0 victory over Rock Hill on Monday night in Centenary, Ohio. CENTENARY, Ohio — Someone had to lose its first conference game of the 2018 campaign. 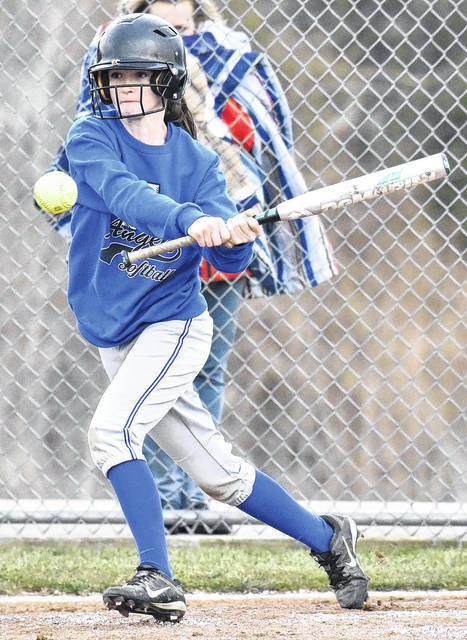 The Gallia Academy softball got all the run production they needed early on Monday night to remain unbeaten in a 2-0 victory over visiting Rock Hill in an Ohio Valley Conference contest in Gallia County. The Blue Angels (5-0, 3-0 OVC) scored their only runs of the game in the bottom of the second inning, as RHHS (6-3, 2-1) left 10 runners on base in the contest. GAHS tacked on both runs in the second frame, as Ryelee Sipple led off with a walk and scored on an error off of the bat of Aubrey Unroe with two outs. Unroe later scored on a single by Bailey Young to propel the hosts to a 2-0 advantage. Both teams battled through a closely contested contested over the span of the next five innings, as Rock Hill mustered seven hits, one walk, and reached on two errors. The visitors appeared poised to rally in the finale, as Rileigh Morris reached on a one out walk and Grace Stevens singled with two outs to put the tying run on base. Gallia Academy however closed out the shutout victory as Makenzie Hanshaw was retired for the final out. 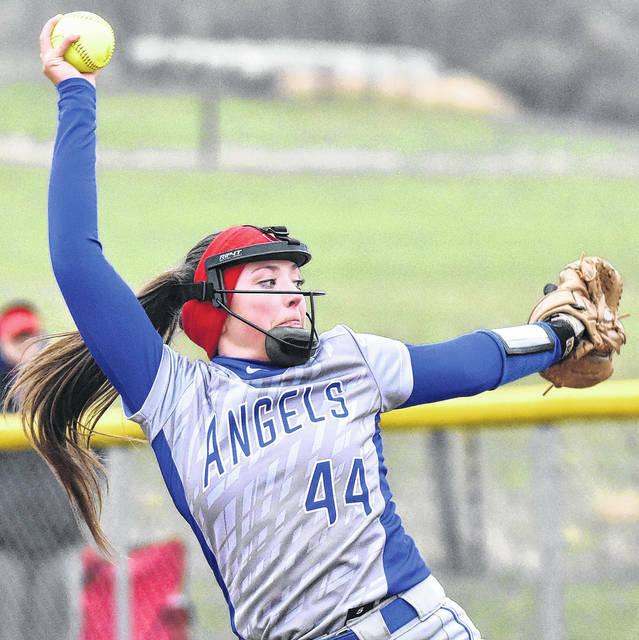 Hunter Copley earned the complete game victory for the Blue Angels, as she surrendered no runs, five hits, with two walks and three strikeouts. 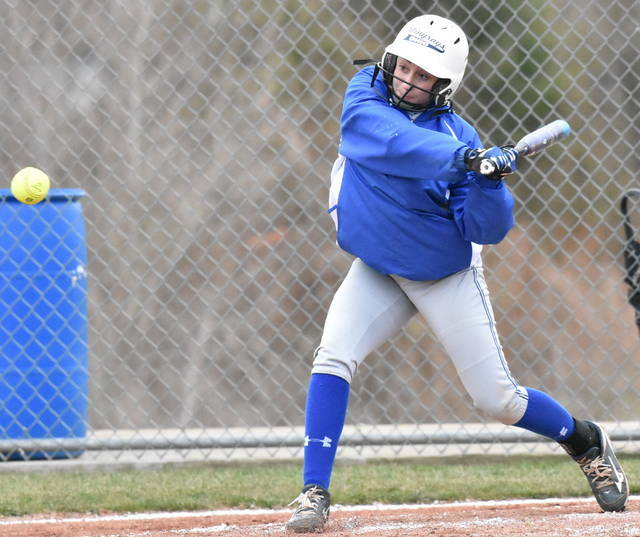 Bailey Young led the way for the Blue and White with two hits and one RBI. Chastiy Adams, Bailey Meadows and Sipple each finished with one safety apiece. Kylee Howard suffered the loss for RHHS, as she allowed two runs on five hits, one walk and struck out one in six innings of work. Katie Adams and Stevens guided Rock Hill at the plate, with two safeties each, respectively. Bailey Harrah, Madison Harper and Morris concluded the hit totals for the Redwomen with one safety apiece. Rock Hill committed three errors in the contest to two by the hosts. “This was a really good game for us,” said Stanley. “Our fielding and pitching both went really well tonight. We were off at the plate a bit, swinging up at pitches, but it was a big win in the conference. We are a top the league by ourselves now, so it’s exciting for things to come. The will look to earn a season sweep of the Redwomen on Wednesday as they travel to Lawrence County.